Technology is the key enabler that can improve customer satisfaction and create competitive differentiation. Meeting unique customer needs often calls for tailor-made technology solutions that can improve operational efficiency, define customer-centric processes, and enable competitive differentiation.Metasis Application Development Solutions are integrated with a combination of the latest technologies and innovative strategies resulting in efficient and robust applications to help increase the productivity of customer’s business. 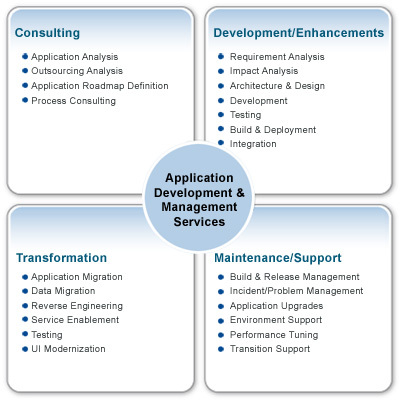 Our solution offers a suite of methodologies including Waterfall, Iterative, Spiral, Prototype, Component Based, Rational Unified Process (RUP), Rapid Application Development (RAD), Agile/SCRUM and industry standard frameworks, which combined with our vast critical domain and technical expertise, provides our customers the best balance in terms of cost, agility, and quality for building applications that meet business requirements. Our consultants expertise span across the most common technology platforms such as Microsoft Technologies, J2EE, Java, SAP, and several other platforms, databases, languages, software, and enterprise applications provide the support customers need during the various stages of application management, starting from the initial planning to the final delivery. Our technical team has the capability to update, expand and re-engineer, or consolidate and customize your application within the minimum delivery time. We are committed to help our customers maximize their business value and minimize their maintenance cost.